The Empyre Pro Series outdoor furnace is leading the way in new high efficiency clean burning technology. For you, this efficiency means savings all around. The Pro Series burns cordwood, a renewable resource and easily accessible in many areas; the Pro Series requires no splitting of wood. Although the firebox is smaller and requires less wood, it maintains burn times comparable to conventional outdoor furnaces at the same output, leaving you with less work and more time. Clean burning also means that the furnace does most of the work. Constant ash cleanup is obsolete with the Pro Series. Although ash is minimal, the Pro Series built-in cleaning portals make sweeping out fly ash from the fire chamber and flues a quick and simple task. The high heat of the gasification process also eliminates creosote buildup in the chimney and reduces moisture in the outdoor wood boiler unit, preventing rust. The Empyre Pro Series combines the simplicity and safety of a conventional furnace with the savings and technology of a high efficiency furnace to provide heat for your house, greenhouse, pool, shop, or other buildings. 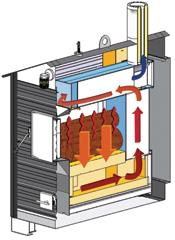 Heat from the Pro Series dual burn chamber is transferred to the furnace’s built-in water reservoir through a series of flues. This heated water is then channelled to your home’s heating system through underground insulated pipes. The Pro Series` full length back door makes plumbing simple. In a house, the heated water connects directly to the radiant or forced air heating system through a heat exchanger. Similarly, the Pro Series heats all domestic hot water through a sidearm heat exchanger installed on the outdoor furnace's hot water tank. 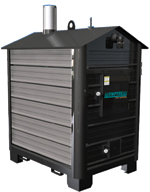 The Empyre Pro Series High Efficiency Furnace is ideal for a variety of applications. It can be used for a single building or residence or piped to other areas. Below are just a few of the possible applications. Contact an outdoor furnace dealer near you for information on setting up an Empyre to meet your needs. In-floor heating is the most efficient and comfortable heating option, as hot water flows through tubes in the floor of a house or building, providing consistent heat. Heat can also be transferred from the Empyre Pro Series through your existing forced air system. A water-to-air heat exchanger converts heat from the water into usable heat for your forced air system. In addition to heating houses and other buildings, the Empyre Pro Series Furnace also provides heat for all domestic hot water. Generally a side arm heat exchanger unit is installed to your hot water tank. Similarly, the Empyre Pro Series can provide heat for pools and hot tubs through a water-to-water heat exchanger installed on the pool heater. Other applications, such as greenhouses, shops, sheds, and other outbuildings use similar hookup methods, and in most cases, a single Empyre unit can provide heat for several buildings. Log Length 22" 26" 34"
Log Diameter 5" 6" 7"
Loading Door Opening 14" x 16" 18" x 18" 20" x 24"
Furnace Width 32" 48" 49"
Furnace Length 56" 73" 81"
Furnace Height 67" 81" 96"
(518) 374-4723 or visit our showroom today! © 2012 Adirondack Stoves, All rights reserved.